While I was in the states I met up with a lot of friends. Among them are the Tolkes. Some of the nicest people I know. 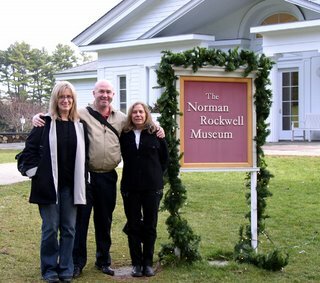 Cathleen and Barbara are in this photo with me outside of the Norman rockwell Museum. It was an amazing experience. I never thought I would get a chance to visit here. Thanks to them I did. He was a fantastic artist. Really, really fantastic. 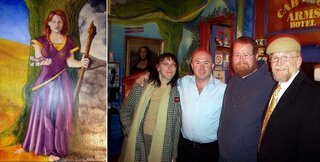 The godess painting (Aisling withthe Apple branch) on the left and some friends (my brother is the one with the beard and no hat) in front of the reception area of the Carlton arms. 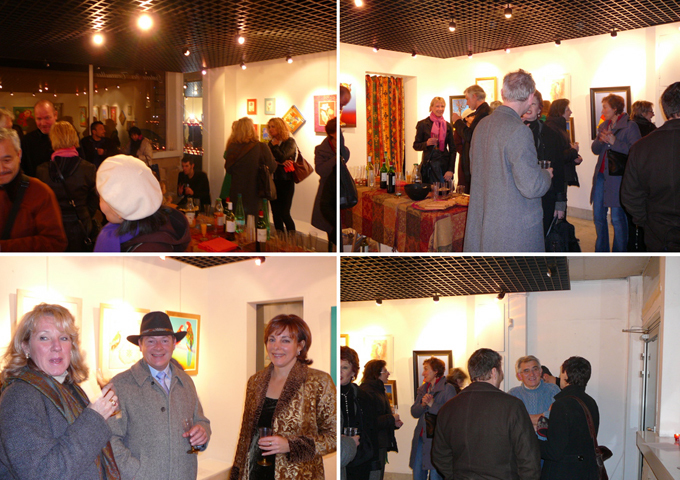 We had a great evening last Monday. The room is finished and I've been invited back next year to do another. It's a great place and I felt right at home. On Monday the party was great and went on till very late. Lots of friends came from far and wide and the guests in the hotel joined in. The Carlton Arms knows how to throw a party. I'm sorry that I didn't take more photos of the event but I'll post the few that I have later. There's a sense of anti-climax now that it's over but I had a great time. 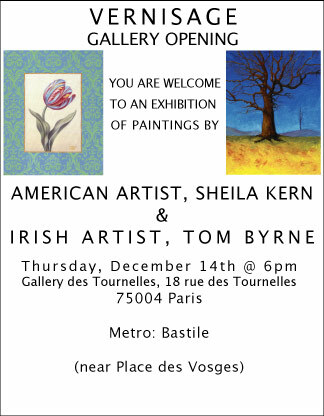 I return to France on Friday. New York is great. If you are reading this post you are invited to a party at the Carlton Arms hotel to celebrate the completion of the room. It's Monday 4th of December 6-10pm, 160 East 25th street. The red door on the corner. What rooms of the hotel are not occupied are party space. 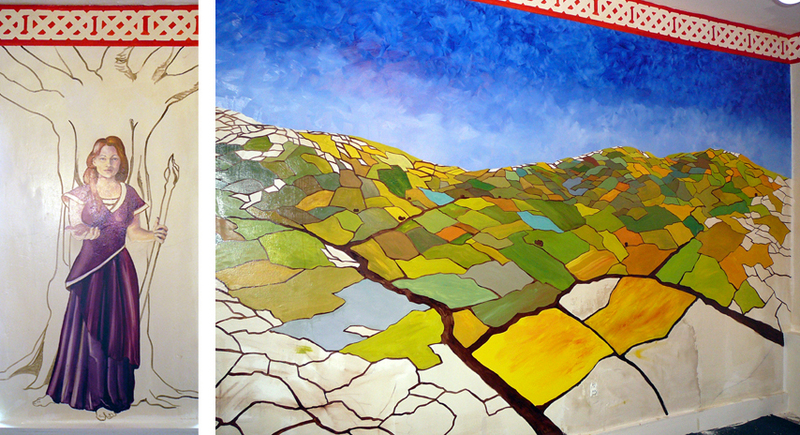 The painting in the Carlton Arms is going well. I've got the guts of 2 walls done. Lot's more to do of course but here are two sections that are almost finished. I discovered that Banksty has done a room here and a wall of one hall too. Good company. I won't be available for assignments from the 14th of November to the 7th of December. I'm painting/decorating a room in a New York hotel. 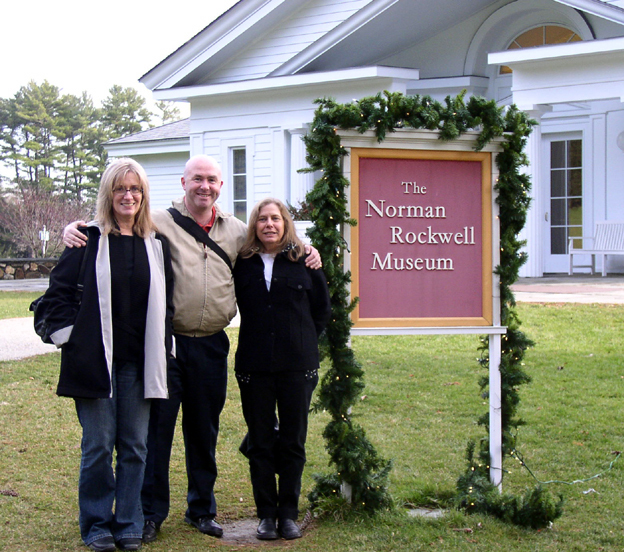 There's a site below that gives you a short history of the place. I'll be staying there and exploring New York and it's surroundings in the time that I have free. Thankfully I've found a good place to go for lifedrawing. I'm really looking forward to it. After Paris, New York is my favourite city. If anyone wants to call me using a local number in New York, there is a telephone number on my website. I'll always be contactable through that. End of one intense period and into another. It's been very busy again. I've finished a very intense demanding project. 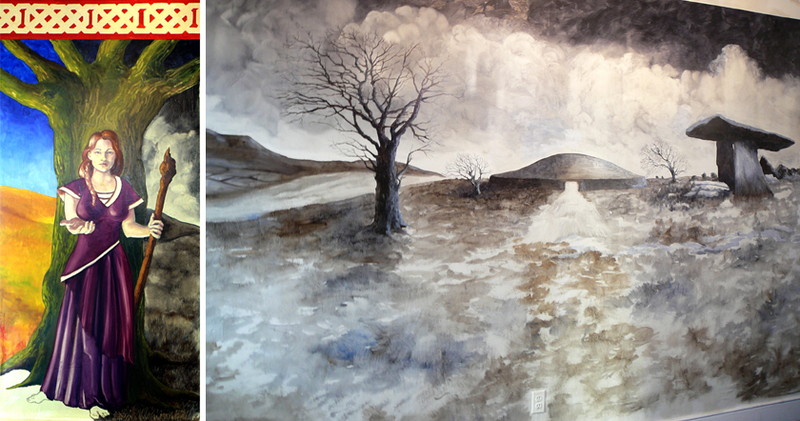 However, now I have to concentrate on finishing the paintings I began two weeks ago. They are for the client on Avenue Wagram and are very important for a lot of reasons. On the 7th of June there is a very large project starting which will last a month and a half so everything has to be out of the way for that. In place of anything else to say here's a photo of the studio where I work. On the left are some of the paintings I've been working on. Behind them, the computer where I am sitting now and to the right the work bench with my paints etc. I took this photo while levitating on the ceiling. It's always happening. I do some meditation and the next thing I find, I've floated up onto the ceiling. Shish! I'm working on some paintings at the moment for a client in Avenue Wagram (subtle plug there). It's been three days so far so I decided to take some time off to visit a friend who has soirees in Paris, on the ile Saint Louis. 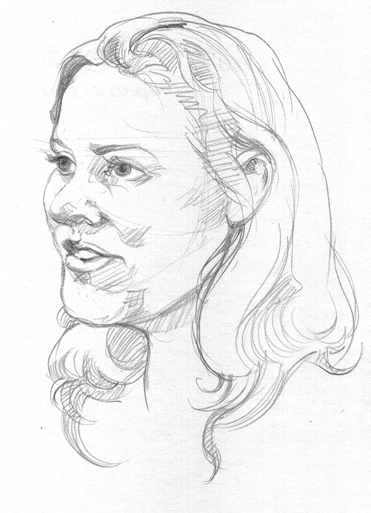 The speaker this evening was Janine Di Giovanni, a war correspondant who is driven in her work. She reminds me of my wife Amelie in her drive to set up a school for Montessori despite the odds. While listening to her speak about her experiences and the book that she has written I did her portrait. Her book is called 'The Place at the End of the World'. She was kind enough to inscribe a copy for my brother Matthew. I think it's the kind of book that he would enjoy. It's a hard one to put down and I suspect it may have a few dog ears on it before this copy gets to him. Worth reading and she's a really decent person. No airs or graces about her. Just down to earth. It's published by Bloomsbury. The Congress is over now and all the doctors have gone home. It was quiet an event and my definitions of luxury have been adjusted upwards. 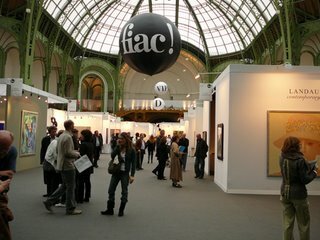 Some stands at the congress were over 8 millions euros, just for a week. The doctors were pretty hard working and the companies were there to woo them to their products. OrbusNeich staff are sincere about what they make. I overheard some discussing how lives could be saved if they could just get the doctors to be aware of their applications. It's not how we visualise sales folk discussing getting product on the shelves. As soon as a client entered the OrbusNeich stand and spoke to the sales staff I began drawing their portrait. Most were doctors. Some were what were called 'hero' doctors. There were especially important to do portraits of as they were highly respected in their field. 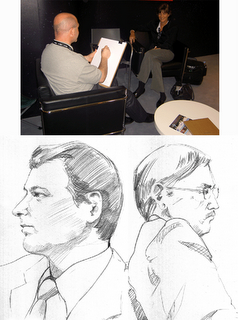 The congress is the most important for Europe but most doctors whose portraits I drew came from all over the world. Indonesia, Japan, the USA, China, Holland, Switzerland, Turkey, Pakistan, and Palestine among others. I knew that I was doing well though when a que of women formed for portraits on the last day. I had intended focusing only on the clients of OrbusNeich but they didn't seem to mind me doing the portraits of anyone who wandered in. It was a hard week. Very tiring but very exhilerating too. Most days when I went home my hands were shaking and that was from how much energy I felt rather than tiredness. Last evening was busy. 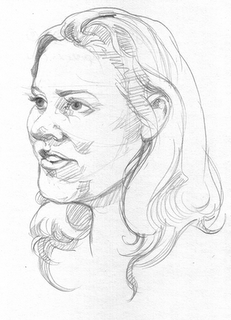 I drew portraits for four hours in a private dinner for doctors and others who work in the medical profession. It took place in Hotel Prince de Gallesth on Avenue George V.
There were about fifty guests all connected in some way to the medical profession. We had a great time. I enjoyed doing the portraits and got a good response from the people there. Brilliant fun. It's surprising how when you are doing the right thing for you that you just don't get tired. I had more energy at the end than I had before I got there. Or maybe that was the champaign. They wanted an artist at the stand because they have a theme that is developed around creativity and painting. The submarine guide which we will be using for the wall of the apartment. It's drawn to scale. The original which the client saw was drawn in pencil so that it would be easy to make adjustments to, while we discussed the content. This drawing (created digitally) is for the other artist who I will be working with as much as anything else. 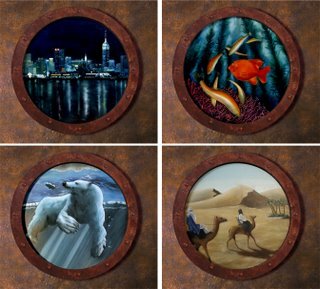 While she is laying in the wall colours and metalic effects I will be working on the paintings which will be seen through the portholes. Then when I have completed those we will work together on the creating of shadows and highlights on the pipes and the metals, getting them to shine and have the correct shadows for the light that will enter the room. There will be a painting of a cat at the base of the wall. He's standing guard against maurading mice and is based on the family cat. Who in reality lives across the street in the families other apartment. Yesterday was what most people would call, full! Most of the time I am working and don't get a chance to meetup with people, view Paris or chin wag with others but yesterday was different. It started with a meeting in an amazing cafe/shop/library on the Champs-Élysées at 12.30. It's called the Publicis Drugstore. The meeting was about portraits which I will be drawing in the hotel George V this coming Monday evening. It will be a dinner with 70 guests and for those who want their portrait drawn I am to be the artist. This shop is really interesting. On the ground floor it's a very posh restaurant with lovely decor. Lots of security guards etc but they are friendly and the atmosphere is welcoming. 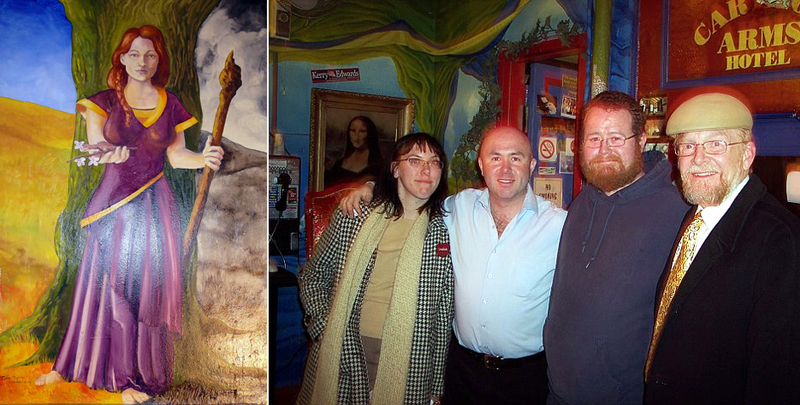 We met there and went downstairs to a lesser known tea room where they serve extremely unusual teas for free. Sounds good. The problem is that they are really good and also very expensive. I had a very interesting cuppa made from the flower of La Petite Amarante. The closed flower is placed in the hot water and it's petals open to reveal a red flower inside. You wait a while and then when the flower has completely opened you have your tea. Delicious but I have to admit that the flavour is extremely subtle. It's looks extraordinary. Best served in a transparent glass teapot to get the visual effect. So they sell the glass teapots and the tea (EU20) for a bag. I bought one for this weekend. Beside the teashop is a wine, whiskey and cigar shop all rolled into one. Facinating place and the staff are very free with their information regarding the wines and cigars (I don't smoke but find cigars facinating). They only have Scotch and American whiskey, I like Irish whiskey too much to capitulate and don't like American whiskeys. After the meeting I went to my French class. 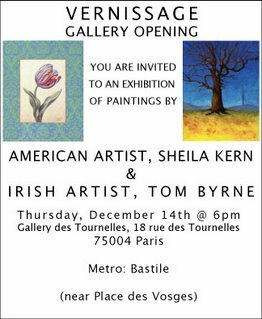 One hour of French lessons and then the teacher (Valerie) and I went off to view the Portes Ouvertes d' artistes de Belleville. Valerie is an artist in glass as well as an French teacher. We saw parts of Belleville that I never knew existed. 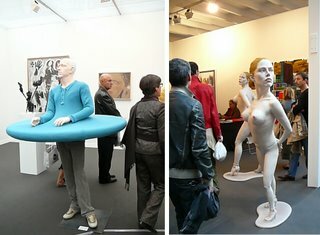 I met a lot of artists and saw their work. 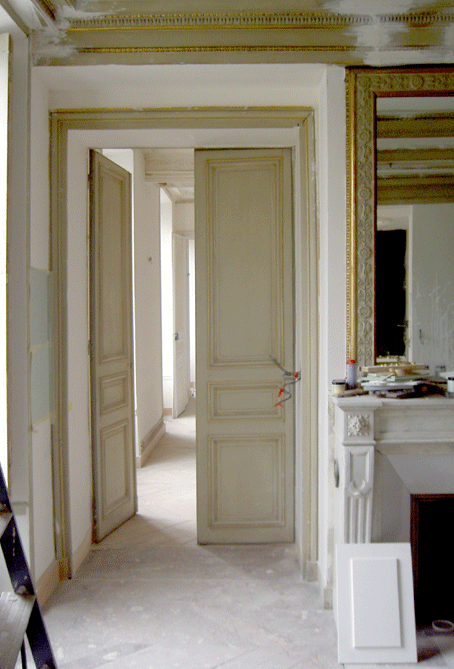 You see inside their ateliers and view the works in progress. Few of the artists work in the same building so you have a map with which you find them and their studios. It leads you down little alleyways and through streets that have no cars and the names are interesting. Nowadays streets are named after intellecutals, musicians and scientists but originally the names of streets were loaded with personal information and each name is a key to the original history of each street. Facinating! Unfortunately I could only be there for 2 hours. but I have the address's of most of the artists now and can come back again. It will be necessary to make an appointment as the portes ouvertes happens only once a year. At 5pm I went to les Jardins de Luxembourg. Beatrice and Sabine were waiting. We had been students in an atelier here in Paris for 6 months studying painting techniques. Beatrice works (for the moment) in a creperie in the gardens and she force fed us crepes and coca cola. Very enjoyable. 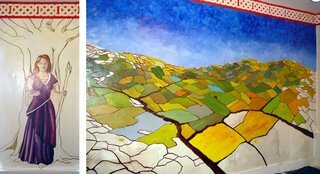 She will be working with me on a Trompe L'oeil in June for a month so we needed to talk through a few details. Sabine is going out with the guy who administers the school where we studied. Great to see them together. There is something that changes when they just stand close to one another. She is tiny and he is over 6 foot tall. It is his birthday today and we went to Thimy Leabs place for a Barbeque to celebrate in advance. I designed Thimy's site and I don't think it will ever be finished because he never gives any information about himself other than to say that he is the son of the prince of cambodia and that he has never been back since the revolution. http://www.thimyleab.com none of that is on his site though. Thimy has been very lucky in the place that he lives in. It is directly opposite his school and he has the ground floor and gardens. Finally he has somewhere to put his paintings. There are four rooms, a decent sized kitchen, a beautifully maintained garden in front and a lovely enclosed garden in the back. No windows, even in the upper floors of the house, look into the garden. It's extremely nice with well maintained plants and grass. There's a workshop and a red tiled roof to a storage area, which has no walls. That used to be for storing wood. It runs all the length of the garden and will be a good place to paint outdoors. Mostly other artists and their friends came along. There was a barbeque and wine, naturally. Tanguy, Thimy's brother, sells very impressive wine and caviar and he brought along a few bottles to celebrate Goathies birthday. We had a great time. I had to leave at about 12 as there is a lot to do today and I didn't want to be wrecked completely but it was a great day and interesting. Today will be letters and painting. Lot's to clear out of the way for the coming weeks. Writing gives me a chance to reflect and stop for a while. And for my first post. Lets start with an aquatic scene. 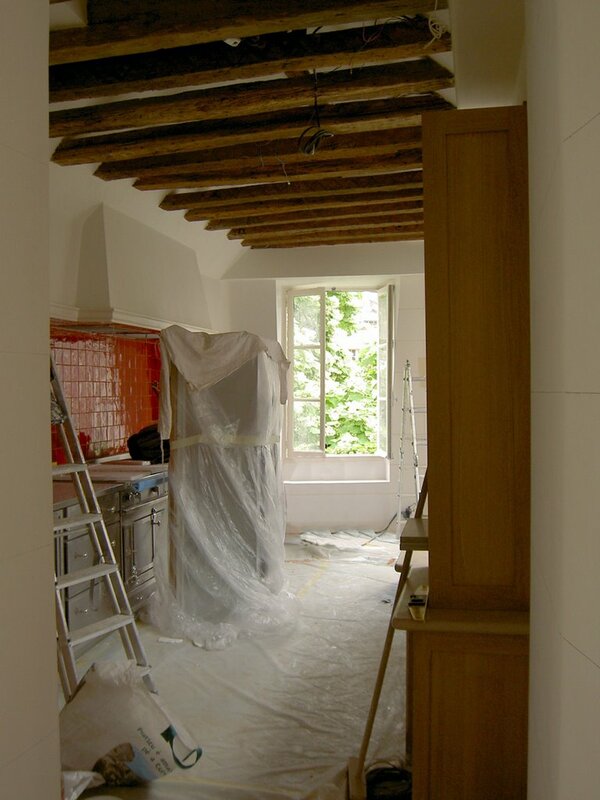 I am painting a large circular scene for a client in Paris. 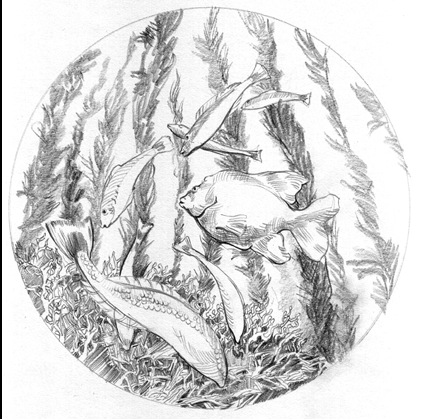 It's an underwater view of a school of fish with kelp in the background and will be done using oils on fine linen. 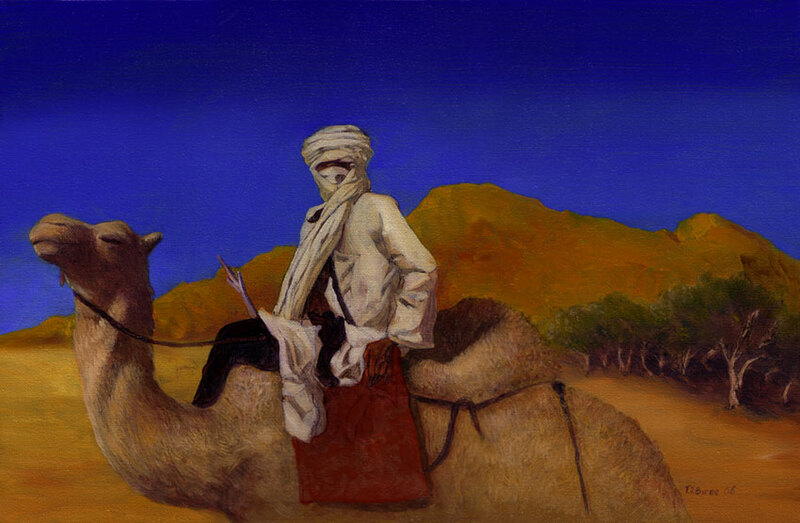 The drawing doesn't give an idea of the luminosity of the scene in my mind nor the colours that I will use. I need lots of shadows to help create the luminosity I'm after so I used the kelp as a swaying curtain to create the contrast between the light and shadow. The light will filter through the kelp to the scene below. There is a sense of a fish eye lens in the drawing but that's caused by the shape of the canvas being round and the view being taken from under the fish looking upwards. The swaying kelp helps to give that impression too. It should take a few days to complete. Hopefully it won't be a problem to photograph when it's wet and shiny. 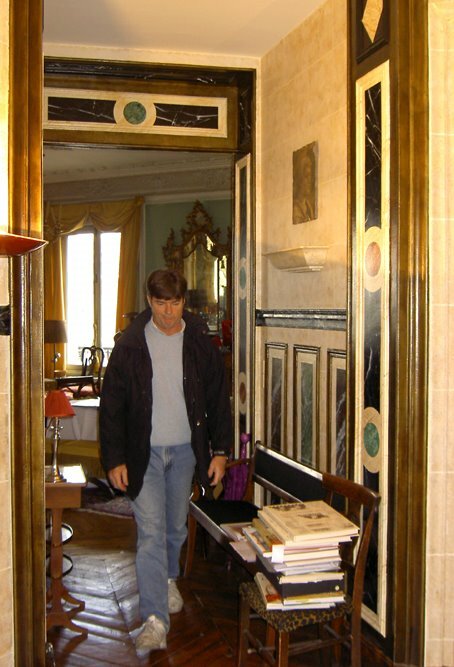 The inspiration for the painting is a Trompe L'oeil which I am working on with another artist in the 5th, in Paris. It's an apartment which is a gift from a mother to her daughter who is getting married. The daughter loves submarines. For this woman, as a gift to her daughter we are painting the hall of the apartment to look like the interior of a submarine. It will be dark and metallic with many different coloured metals. Copper, tarnished and rusty iron, brass and some silver for artistic license and to lighten the mood. 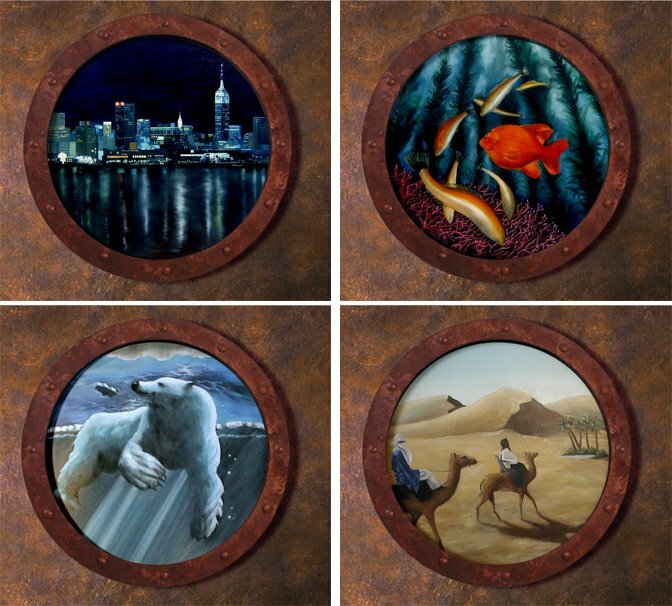 The portholes of the submarine will look out onto a fantastic world. Two views will be under water and two will be of landscapes. One man made, of NY and the other desolate but beautiful, of the Saraha desert.